A free, technology app containing a database of all health stations and hospitals information so citizens can access and reach needed services faster. Books will be collected from people who don’t use them anymore, and made available to students in need. A large, non-profit website that will help children with terminal illnesses around the country carry out their final wishes. A non-governmental organization to support sales of bio-agricultural products. 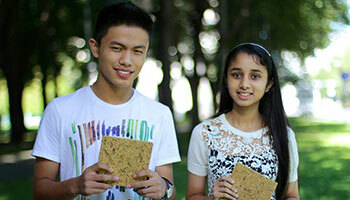 “Green Wood”: A revolutionary building material, made from rice husk boards. This concept provides information booths on healthy diets, relating to a ‘girl’s life these days’. A book concept that teaches young children about the environment. Producing papyrus mats made from papyrus reed that prevents mosquitoes from getting into rooms. The objective of H.O.P.E is to reinforce tools to promote basic management skills in developing countries. Using natural ingredients to make mosquito repellent bands. Recycle old notebooks that have some blank pages into new ones and donate them to students who can’t afford to buy their own notebooks. This concept creates classes and courses within hospitals for students with long-term health issues so they can continue their studies. This concept raised awareness of the problems and needs of various organizations in the social sphere including kindergartens, orphanages, animal shelters, etc. A solution to help physically disadvantaged people to play sports and make them feel more adapted into society. Fun and educational activities to teach kids how to eliminate food waste. The “Joy Swings” concept uses the kinetic energy of children playing to produce electricity. A non-profit aimed at educating youth about how to care for pets responsibly. Use recycled waste materials from the community to create affordable, educative toys.